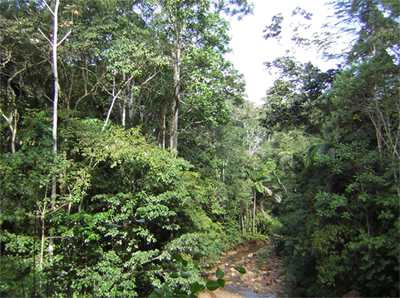 The foothill tropical rainforest is my favourite habitat in Bolivia. I love the rainforest, but get very frustrated with the bird canopy foraging flocks which one never can see well. In the lowland rainforest the most dazzling unforgettable flocks of 30+ species pass over your head, while you strain your neck muscles to their limit to catch underbelly field marks. The foothill habitat is the answer to this problem, by offering the ability to jog up the road and see directly level into the canopy, absolutely anywhere! The area is one massive canopy walkway. Serranía Sadiri & Sadiri Lodge, found just inside Madidi National Park is one of the first serranias of the Andes, which means it traps the warm moist humid tropical forest air following the prevailing winds south across the Amazon. As a consequence this area has a much higher level of precipitation than surrounding areas, which equals higher bird diversity and abundances. Two hundred and twenty-one species have presently been recorded in the area, where we expect totals of around 300 bird species (see Sadiri Bird List). And Sadiri abounds in foraging flocks- and foraging flocks that you can see well. 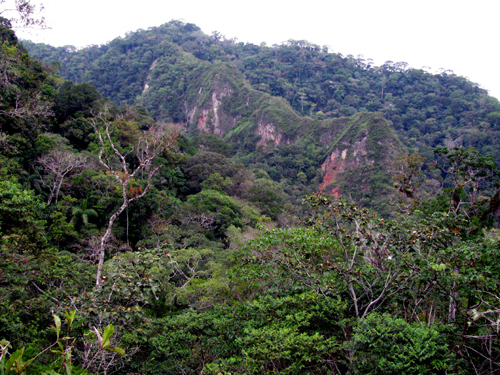 Serranía Sadiri peaks at 3200 feet (950 m) and then the road travels down the inner moist slope to a typical tropical forest habitat at 1650 feet (500 m). A fifteen minute drive down to the lowland rainforest, where one can spend the day searching for antbirds, ovenbirds, toucans, macaws, and woodcreepers. But at the end of the day, return back up the slope to a cooler foothill forest- offering a pleasant place to sleep after a hot day. For hundreds of years, people have been travelling between the towns of Tumupasa and San José de Uchupiamonas, and further up into the Andes to the town of Apolo on PRE-Inca trails over Serrania Sadiri ( 950 m) and Serranía Yuruma ( 850 m), allowing access to a relatively undisturbed Tropical Hill Forest habitat. Later a dirt road was created on the trail between Tumupasa and San Jose de Uchupiamonas (which is open for half the year) between the towns Tumupasa and San José de Uchupiamonas. Birds of the foothill forest habitat identified during a two day visit to Serranía Sadiri included: Band-bellied Owl, Plain Antvireo, White-bellied Pygmy-Tyrant, Thrush-like Manikin, Scaled Fruiteater, Sharpbill, Bronze-green Euphonia, and Slate-throated Whitestart. This is also the only accessible area in Bolivia where the Cinnamon-faced Tyrannulet can be found. Look for it on the top of the northern slope keeping an ear out for its whisper song. Logistics: See The Sadiri Rainforest Lodge. Contact us.